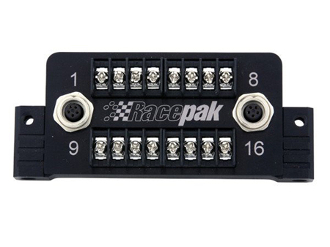 The Racepak Switch Module provides the ability to use existing switches in conjunction with a SmartWire module. Switches are connected to the spade connectors of the Switch Module, and switch data is routed to the SmartWire via a single cable. Adding a second Switch Module is quick and easy, through the use of a short jumper cable between the two modules. Machined from billet aluminum and black anodized.